Summer 2019 will see 88 new bike stations and 880 new bikes added to the current network of 150 bike stations and 1,500 bikes in Helsinki. In addition, some new stations will be added in the current area. Stations will be located in the vicinity of employment, service and housing hubs as well as close to rail service stops – in areas where there are the most people. When planning the expansion, special focus was given on East Helsinki. 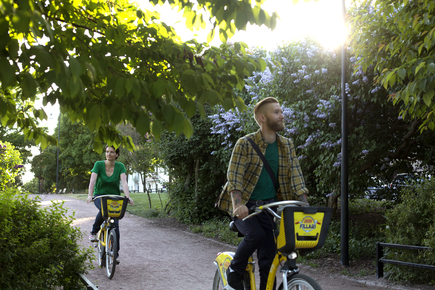 In 2018, more than three million journeys were made by the city bikes in Helsinki and Espoo. About 48,500 users registered for the full season, and there were about 6,300 weekly pass users and approximately 15,000 day pass users. The city bike season has also been extended: last year the season ran from April to the end of October in Helsinki. The popularity of the city bikes has exceeded all expectations, including financial targets. Last year, the user fees covered nearly all of the City funding for the bikes in Helsinki. In Helsinki, the utilization rate is high in comparison to other cities worldwide, with approximately nine journeys per bike every day. In other parts of the world each bike is usually used for approximately four journeys per day. The new bikes added next summer will ease the problems of bike availability. The next city bike season will start in Helsinki and Espoo on 1 April 2019, mostly with the same station network as last year. In Helsinki, the new stations that are part of the extension of the service will be available in early May. Like in previous seasons, registration will be opened a few weeks earlier. See the location of the new stations on this map.